An implantable body battery 100 times smaller than a standard AA battery has been developed by Argonne National Laboratory in cooperation with Quallion and the University of Wisconsin. The battery will power a system designed to help patients with neuromuscular disorders. 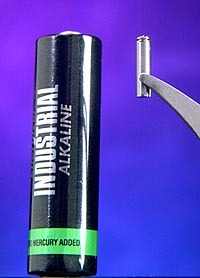 This is the same kind of system powered by the Quallion I Series battery. The implantable microstimulator system is designed to help patients with neurological disorders and muscular impairments like Parkinson's, stroke and urinary incontinence. The microstimulator system, like the refurbished nervous system proposed by Bester, is implanted near nerves, and emits electrical micropulses that stimulate muscles and nerves. 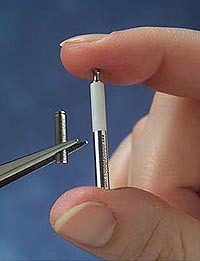 These systems have been in use for more than a decade; the Bion microstimulator is a miniature, self-contained neurostimulator. A significant difference is that the actual system uses microstimulators that are self-contained; Bester's fictional system requires that all of the stimulators be interconnected and powered from a single source. Read more at Argonne researchers becoming nation's experts in lithium-battery technology; thanks to Roland for the story.